I’ve made a version of this soup before. 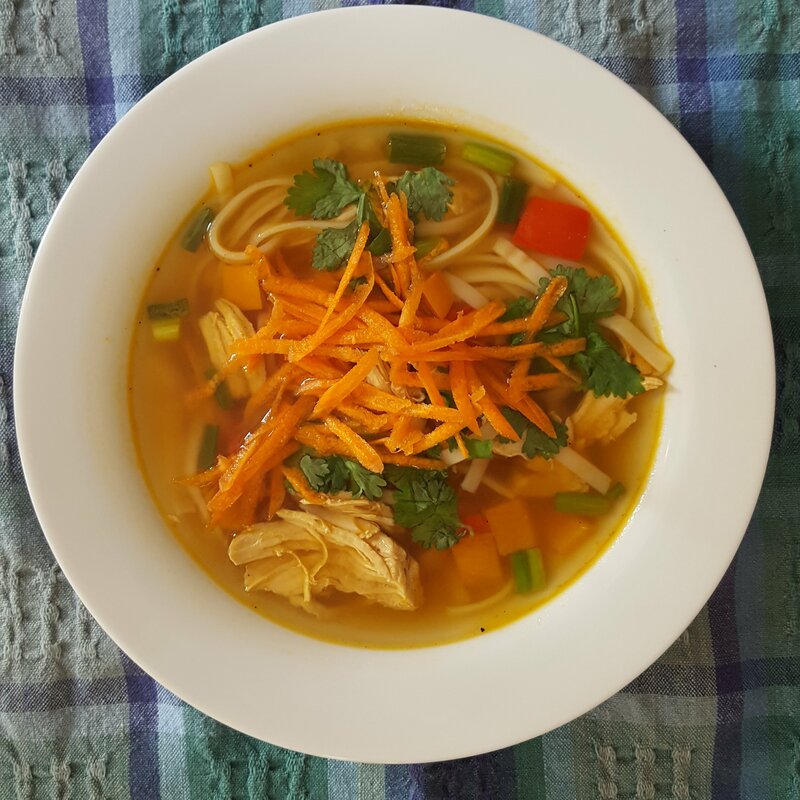 This Asian Chicken Noodle has a little more kick and depth of flavor from cooking the chicken in the pot first. But like most soups, anyone can adapt it to whatever their personal tastes are or what needs to be used up in the pantry. It’s a good soup to make when you are feeling a little down from holiday stresses. Right now, everyone, it seems has a cold. I had a lingering sore throat for weeks. Hoarse every night after projecting my voice in the school lunchroom ( read: shouting). It wasn’t until after I took the advice from a colleague to employ the old school treatment of gargling multiple times a day with warm salt water that I was finally cured. Of course, the soup helped by soothing my throat and warming up my aching bones with its spicy notes of ginger, Sriracha and Thai red curry. Whatever your December malaise or Holiday woe, this zippy soup will be sure to pick you up so that you can keep going. Season chicken on both sides with garlic powder, onion powder, salt and pepper. Heat a large soup pot on medium high. Add the oil. Once the oil is shimmering, add the chicken. Allow to sear on one side until the chicken releases from the pan. Flip the chicken and sear for another 4-5 minutes until the second side releases from the pan. Add 3 tablespoons-1/3 cup water to the bottom of the pan to loosen chicken bits and juices. Turn heat to simmer, cover and cook chicken for 10 minutes, until just cooked through. Remove chicken and juices to a dish and cover with tin foil. Add peppers to soup pot. Turn heat back to medium high. Saute peppers until they begin to soften, about 2-3 minutes. Add chicken broth and all seasonings through cider vinegar. Shred chicken and add back to pot along with any accumulated juices. Bring soup to a boil, reduce heat to simmer and cook for 20 minutes. Meanwhile, add 6 cups of water to a large saucepan. Bring to a boil. Add rice noodles. Cook 3 minutes, then drain. Place about 1/4 cup-1/2 cup of rice noodles in each serving bowl. Taste soup and adjust seasonings. Ladle soup over each noodle serving. Serve with garnishes on side. I love Asian flavors! Thanks ! Yummy soup, great one for the cold weather..
Can’t wait to make this one again considering the storm we just had! Hope it’s not too cold where you are!